Were Canadian Oil & Gas Companies Able to Raise Finance in 2015 and 2016? New analysis from CanOils has shown that while the total value of Canadian oil and gas company financing arrangements being completed has fallen since the commodity price downturn began in late 2014, companies have still been able to raise finance. Equity Financing – The raising of funds through the sale of company stock, either in the form of common shares, warrants or a combination of units. Debt Financing – The raising of funds through the initiation of a loan agreement or note offering. Excludes drawings on revolving credit facilities. 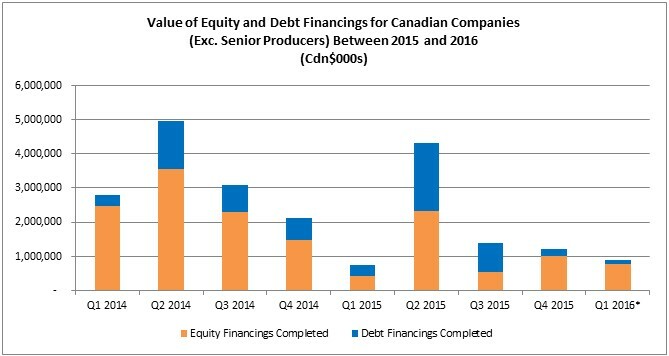 Source: CanOils Financings – Note: Q1 2016 represents the value of all equity and debt financing deals that completed between January 1, 2016 and March 21, 2016, which was the time of writing. A senior producer is a company that produced over 100,000 boe/d in Q4 2015. This Cdn$8.6 billion total is of course much lower than the 2014 total of Cdn$13.0 billion and there was a steep drop in finance raised from Q2 2014 to Q1 2015. While the price downturn is the main instigator of this drop in finance being raised, these numbers themselves do not give any idea whether the drop is due to companies being unable or unwilling to source extra finance. In all likelihood, it is probably a combination of both. Companies might have seen it as a tough prospect to approach a bank for a loan outside of its existing credit facilities or to successfully issue new shares in a struggling marketplace at lower prices and not moved ahead with any such plans. Equally, if companies did try and get a new loan from a bank, it may have been refused – something that would be unlikely to ever reach the public arena. One thing that is clear from the chart above, however, is that when finance was raised in 2015 and in 2016 so far, it would come increasingly through an equity-based arrangement rather than debt. Right up until the end of Q3 2015, it was almost a 50/50 split between debt and equity financing agreements to raise funds. There were less equity and debt financings (in terms of value) between the end of Q2 and Q3 2015, but from this point on, the companies that produced between 0-100,000 boe/d stopped raising finance through debt-based deals almost entirely. Only Cdn$300 million of new debt financings were agreed between the end of September and March 21, 2016. In contrast, the rate of equity deals did not slow at all, being completed at roughly the same rate as they did between Q2 and Q3 2015; Cdn$1.8 billion of new equity financings completed between the end of September and March 21, 2016, resulting in a steady average of Cdn$790 million of new deals between the end of Q2 2015 and March 21, 2016. 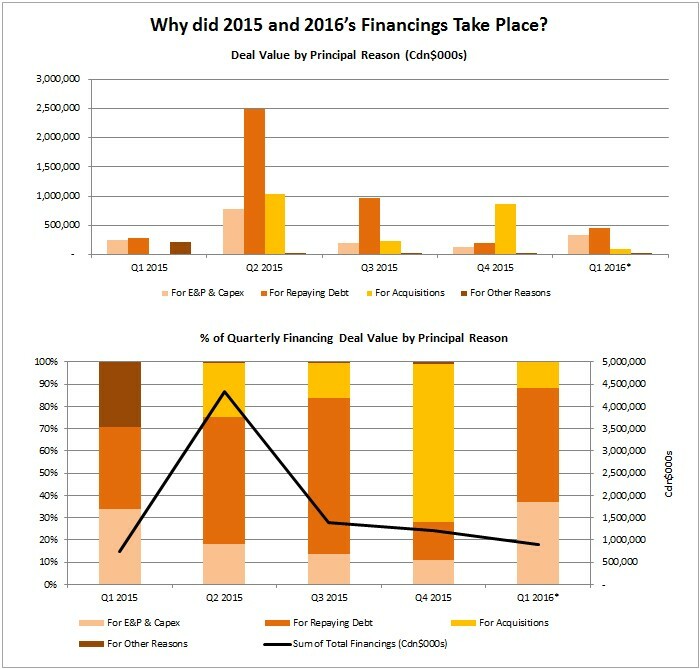 While it is not possible to tell from the data whether the drop in financings following the price downturn was primarily down to companies being unable or unwilling to raise finance, we can see the key use of proceeds from finance raised in 2015 and 2016. 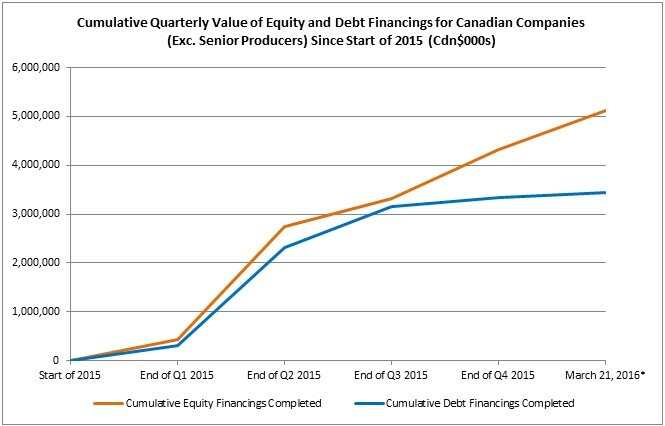 Source: CanOils Financings – Note: Q1 2016 represents the value of all equity and debt financing deals that completed between January 1, 2016 and March 21, 2016, which was the time of writing. The data only includes equity and debt financing deals for companies producing between 0 and 100,000 boe/d as of Q4 2015 or Q3 2015, depending on the latest available report for each company as at March 21, 2016. 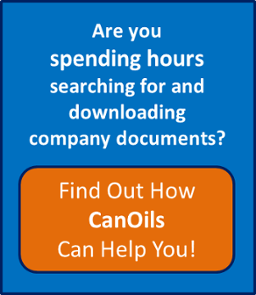 CanOils Financings provides the principal reason behind every financing that completes and repaying debt was perhaps unsurprisingly the main motivational factor behind most deals in 2015 and 2016. Cdn$4.4 billion – over half of the total Cdn$8.6 billion raised – of the finance raised in 2015 and 2016 was primarily used to pay off debt. Again, unsurprisingly, with capital expenditure budgets slashed across the board and companies focusing on sustaining operations rather than development, finance being raised to fund capital spending was low at Cdn$1.3 billion in 2015 and 2016. Capex funding did increase in Q1 2016, with Cdn$328 million raised for this purpose, more than Q3 and Q4 2015 combined, but this is nearly all from one deal completed in February by Seven Generations Energy Ltd. (TSX:VII) for Cdn$300 million. There was a significant amount of cash (Cdn$2.2 billion) raised to fund acquisitions and pay off the debt included in those acquisitions (see note 3). Opportunistic, cheaper-than-usual acquisitions have been a symptom of the price downturn, where confident or stronger companies have picked up an entire debt-laden smaller company in cut price deals or boosted core asset positions with a cost-effective purchase of a struggling company’s non-core assets. 1) All figures here for finance raised refer to gross proceeds. This is the amount raised in the financing, before any deduction of underwriters’ fees or general expenses related to the financing deal, as these costs are not routinely provided for every deal. 2) This article includes all financings completed from January 1, 2014 up to and including March 21, 2016, which was the time of writing. This article does not contain any data related to drawings on credit facilities, nor financings that have been announced but not finalised. 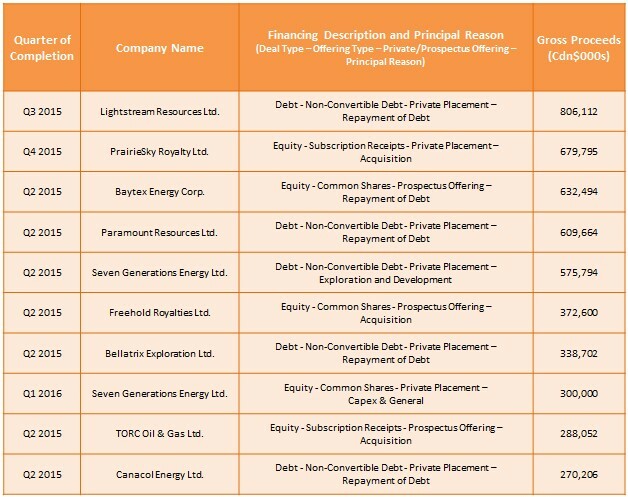 3) If finance was raised to pay off debt involved in a corporate acquisition, the principal reason for the financing is listed as “Acquisition” rather than “Debt Repayment” in CanOils. This is for the simple reason that without the acquisition in the first place, there would be no debt to repay. 4) The companies included in this article have been chosen based on the fact that they produced between 0 and 100,000 boe/d in their most recent report, typically Q3 2015 (September) or Q4 2015 (December), depending on the company. Any company that produced under 100,000 boe/d in Q2 2014, for example, but now produces over 100,000 boe/d, is excluded throughout.